1. Your computer and the Exede modem. You may connect your computer directly to the Exede modem with an Ethernet cable (included). Better yet, connect a wireless router to create your own local wireless network, enabling you to connect multiple computers, tablets, smart phones and other wireless devices to your Exede service. Our dish receives signals from and transmits signals to the satellite. It’s about the same size as satellite TV dishes, and can be mounted to the outside of your house, on the roof, or on a pole on your property. Located in geostationary orbit 22,000 miles above the equator, our satellite provides an efficient, effective method to provide high speed Internet service to the U.S. using spot beam technology. The main purpose of the satellite is to relay signals from your home to our gateways, and back again. Our gateways are located throughout North America. 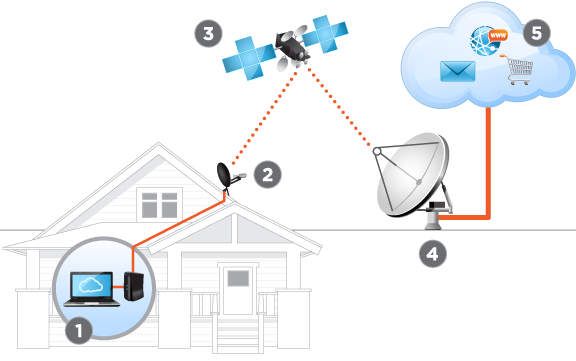 The gateway receives the signal from the satellite and connects it to the Internet, and transmits the data from the Internet back up to the satellite. Everything on the Internet that’s available via a wired connection is also available through Exede satellite Internet service. You will now be able to browse the web super fast, download music and movies, share photos and video chat with friends and family, and much, much more. 1. What Exede service plans are available to me? 1 a 12Mbps downstream/3Mbps upstream service in the regions covered by our new ViaSat-1 satellite. 2 a 5Mbps downstream/1Mbps upstream service for most of the rest of the nation. Within each region, the service plans all will have the same high speed and vary only by data allowance. Please call us to find out which service is available in your area. 2. So I get the same speed no matter which plan I buy? Yes. We believe that you should not have to pay extra in order to get the highest speed we offer. You buy the amount of data you need. 3. How can you offer such fast speeds? Are the super fast services provided via a new satellite? Yes. The rollout of Exede broadband service is a major milestone in a process that began in 2008 when ViaSat started construction on its next-generation satellite system, representing the most significant capacity leap in the history of satellite technology. The system uses the the breakthrough ViaSat-1 satellite that was launched in October 2011. ViaSat-1 has more capacity than the rest of the communications satellites over North America combined, and is designed to serve over a million subscribers. 4. Is ViaSat-1’s high capacity the reason for the high speeds? That is part of the reason. Our new service incorporates new, ground breaking web acceleration technology which dramatically speeds up page load times. So in addition to the much higher speeds enabled by our high capacity satellite, you will experience a much snappier web browsing experience. The combination of ViaSat-1, our web acceleration technology, and equipment is what facilitates these exciting new services. 5. What kind of new things can I do? Is the experience different than previous satellite Internet services? We’re about to change everything you think about broadband via satellite! With the new Exede service, you can now enjoy the full extent of what the Internet offers: We will continue to roll out enhanced services, such as Voice, over time. 6. What happens if I exceed my monthly data allowance? If you use up your data allowance before your monthly reset date, your service will be slowed. On a monthly basis your usage will be reset to zero, at which point your speeds will be restored. If you find that you need more data than your plan allows, you can always upgrade to a higher data plan. There is no charge to upgrade (or downgrade) your account between packages. 7. I’m a current WildBlue customer. Can I get the new Exede service? Yes. As a valued current customer, we want to offer you an opportunity to upgrade to our new service. We are offering a Priority Upgrade Program for our current customers. We expect to begin our upgrade installations in April. The upgrade will require a brand new satellite dish and modem which will be installed and configured by a certified technician, and the new service requires a fee to get started. Please call us so we can fill you in on all the details, including applicable upgrade fees. 8. What if I choose to stay with my current WildBlue service? We remain dedicated to providing high quality service for customers who wish to continue their WildBlue service. In fact, we plan to begin implementing technology upgrades for our WildBlue customers later this year. Most importantly, you won’t have to do anything to get these benefits – they will be rolled out automatically as the new levels of service become available. Even if you choose to remain on your existing WildBlue service, improving your service experience remains a priority for us.